You might have noticed that SiftSwift tools give you the option to “Pareto rank” products by your preferences. If you did, you probably also wondered what that means and when you’d want to use it. In a nutshell, Pareto ranking is useful when you care about more than one aspect of a product. In this situation, regular sorting won’t get you what you want because it emphasizes just the first preference in the list. It’s worth noting that Pareto ranking is especially helpful when there are tradeoffs between those aspects you care about. What follows are some examples to illustrate its usefulness. One example where Pareto ranking can come in handy is searching for high-yielding bank deposit accounts, especially if you have some flexibility on how liquid you need to keep your funds. Everyone obviously wants a higher interest rate (APY), but, as you can see in the scatterplot below, there’s a tradeoff between the deposit term (how long you lock up your cash in a CD) and the interest rate you can earn. You’d probably want to know which deposit accounts are represented by the points along the topmost edge or “skyline” of that plot, so you can consider them first. Then, if none of those #1 ranked accounts are appealing, you’d probably want to know the next best accounts that make up the new “skyline” after removing the first rank — i.e. those in the #2 rank, so to speak. That’s exactly what Pareto ranking does for you. It presents products to you in that order, according to your chosen preferences. If you go to our bank accounts tool, you’ll find it’s pre-configured to use Pareto ranking by default. Of course, you can always switch to regular sorting if that better fits your sifting need. Sometimes Pareto ranking can make it easy to answer a question that would otherwise take some work. An example question is: How much more could I potentially earn from a reward credit card if I improved my credit score? One can easily get an estimate of this using our credit cards tool using the configuration shown below. 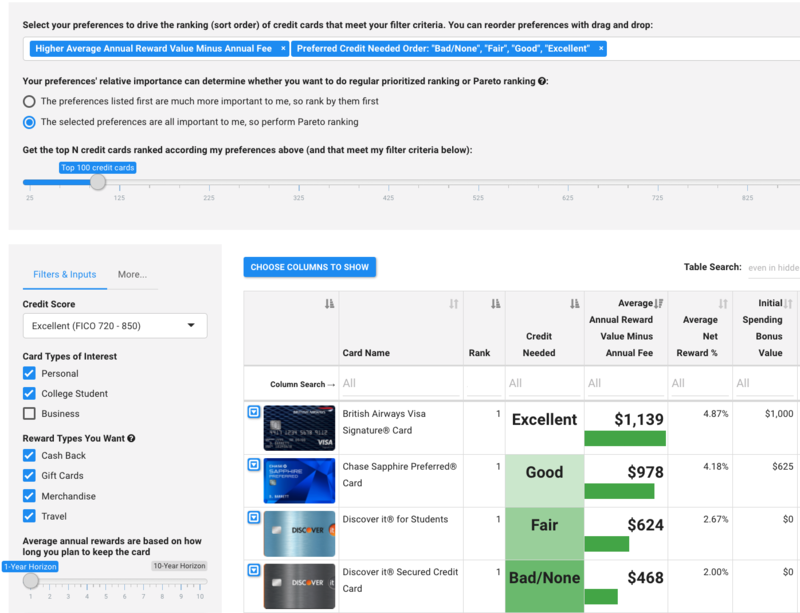 Because we’ve chosen Pareto ranking, the cards listed first represent the best-earning rewards cards within each distinct level of credit (so long as each higher level of credit enables you to earn more reward value than lower levels of credit). Feel free to play around with our credit card tool in this configuration. Because Pareto ranking is not common in tools, it may take a while to “wrap your head around it”. Hopefully this introduction gave you enough to understand it without being overwhelming. If you have any questions, please don’t hesitate to ask them via a comment below. Happy sifting!